Is 'Afalina' the awaited “affordable” helicopter? There were not many new products on show at the international helicopter exhibition ‘HeliRussia’ 2015, which ended last Saturday. However HeliWhale, a company from Kemerovo (Siberia), which debuted at the show, presented an ultra-light helicopter with coaxial rotors, the “Afalina” (Bottlenose Dolphin). Analysts are sceptical about the viability of the “affordable” helicopter. 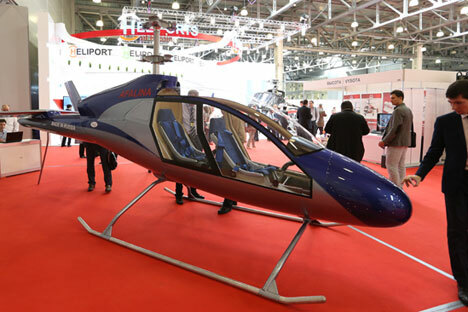 An ultra-light, two-seater, multipurpose helicopter ‘Afalina’ arrived at the Moscow exhibition, without rotors. The developers explained that they decided to directly present their creation in public seeking constructive criticism, so they could “shape it up” later. HeliWhale specialises in rotors. ‘Afalina’ has coaxial ones, which are considered quite difficult to produce, maintain and repair, even though they are optimal for light and ultra-light helicopters. With this rotor positioning the helicopter is easier to pilot in the mountains, it is more resistant to lateral wind gusts, it is silent, compact and does not require large spaces for takeoff and landing. ‘Afalina’'s developers claim their helicopter has an entirely new control system of coaxial rotors, patented by them, which provides for the helicopter's high velocity. In addition, ‘Afalina’ can be refuelled with conventional car petrol (95 octane). Combined with the heating and ventilation systems in the cabin, its low starting price (US$120.000/-) should, according to its creators, make it attractive to potential users; among them the Ministry of Emergency Situations, agricultural workers, flight schools, and air ambulance companies. Maximum flight speed at ground level 250, cruising - 200. Service ceiling - 3000 m., Maximum range - 700 km, fuel consumption at cruising 18-22 liters per hour, tank capacity of 60 liters. The production plant for the ultra-light rotorcrafts has already been built in Kemerovo. It has a production capacity of 10-15 helicopters per year. Consumers will receive vehicles in the form of kit-sets models for self-assembly. This will guarantee low prices on a helicopter and show the way to soon begin the series production. “Today nobody else produces aircrafts of this class, even the two-seater ‘Robinson’ is heavier than ‘Afalina’ and is, in fact, a completely different machine,” Jacov Kolesnikov, General Director of HeliWhale told RIR. “The American ‘Robinsons’ are also much more expensive. A two-seat helicopter costs US$ 300.000/-. Our helicopter, with imported engine (for now we have Rotax), costs half,” he said. “We are looking for domestic engines, and if there is a quality Russian engine, maybe we'll switch to it. Besides this, the helicopter has no imported parts, we built it ourselves, from scratch,” Kolesnikov said. HeliWhale's only flying prototype will soon be put to endurance tests. Is an “affordable” helicopter possible? HeliWhale is counting on markets in Australia, the US and Europe, in addition to domestic demand, to make the prodeuct economically viable. They claim they already have orders for ‘Afalina’. There is a simple explanation for looking to foreign markets for ‘Afalina.’ Air space regulations in most of these countries are less strict. Russia is one of the few countries which does not provide free airspace below flight level of 300 metres. An airplane or a helicopter must rise above 300 metres and integrate into the air traffic. To become a full member of the air traffic, it must undergo certification procedures. Vladimir Shcherbakov, deputy chief editor of ‘Take-off’ magazine, is sceptical about the idea of a “popular helicopter” in Russia. “Further realization of the project requires major investments, while to sell this helicopter somewhere will require much more money than was invested in its development and production. In addition, it will be necessary to carry out after-sales service later. A small company can not provide it effectively, in different cities of the country or abroad, so it would go bankrupt,” Shcherbakov believes. “The very niche of ultra-light helicopters is quite interesting, not for the cities, but for the provinces; for example, for a farmer to fly someplace. However, we do not have the infrastructure, and petrol is expensive. Also, with all the promised low prices, helicopters cost quite a lot of money, and considering the fluctuation of exchange rates, a common person is unlikely to be able to afford it,” Shcherbakov said.